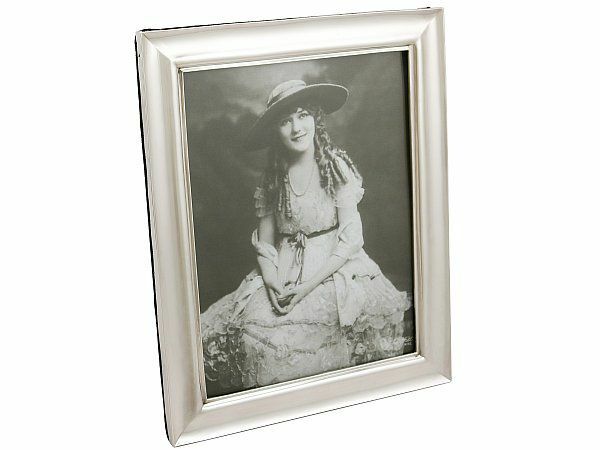 This exceptional antique sterling silver photograph frame has a plain rectangular form. The surface of this George V silver frame is plain and unembellished accented with paralleling swept raised borders to the rim and internal window. This impressive photo frame has a velvet covered back and hinged strut, secured with a swivel catch; the body and strut of the frame have been recovered in navy velvet replicating the appearance of the original covering. 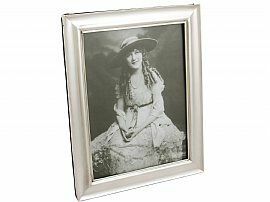 This antique sterling silver photograph frame is an exceptional gauge of silver, exceptional quality and in exceptional condition. Width of internal window 15.5cm/6.1"